We have some great golf flyers with great golf deals year round. 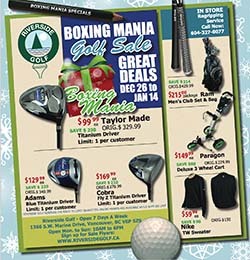 Come to this golf flyer page to see new Riverside Golf flyers. Or register to receive a sale flyer. We’ll be putting out flyers more regularly, specifically for spring specials, summer specials, fathers day, mothers day, end of season, thanksgiving, Christmas, and boxing mania. We’ll try to get more specials out to you as the year goes by, so sign up and keep informed. You can also follow us on Facebook an Twitter. And our blog will soon have some product reviews and videos about new golf products. 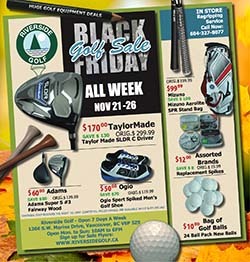 Share our flyers links with friends and support your local golf shop! Thank you for visiting Riverside Golf. Signing up for flyers gives you some exclusive benefits to some in store specials, as we may not publish it anywhere else, so don’t miss out on exclusive golf deals. Just to make it easier, when you find a good deal on our flyer you can find our locations in Vancouver and Nanaimo by clicking the locations on the menu. We have some great golf deals on a weekly or monthly basis. Sign up now and keep up to date on any e-flyer notification so you can view our latest golf products on sale. 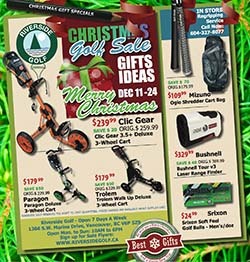 Thank you in advance for your interest in Riverside Golf and our products.